The UAP high security front door handle has a 219mm short backplate, and is aimed at the fabricator who wants to offer a high quality, ergonomically shaped and designed door handle range but who doesn’t want to get involved in fitting a cylinder guard. 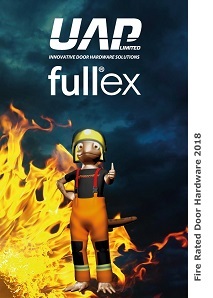 This fit and forget handle is packed with state of the art features, and can be used by the professional installer offering a security upgrade service. 1 – Anti-Drill Resistance – The integrated cylinder guard helps protect your door from drilling attacks. The blind cylinder end only makes the plug of the cylinder visible, helping to protect the pins inside from being drilled. 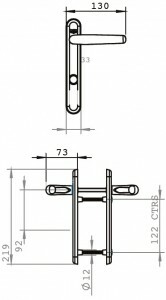 The front door handle can be sprung and unsprung, as the spring inside can be easily removed. Gold anodised, silver anodised, black and white front door handles are made from aero-space grade aluminium, and come with a 10 years colour fast coating guarantee. Please note: In order for the handle to fit and the cylinder to sit flush against the door, the recommended cylinder size is 65mm. The external side of the cylinder should be 5mm shorter (must use 30/35 or 30/35T cylinder on 44mm doors). 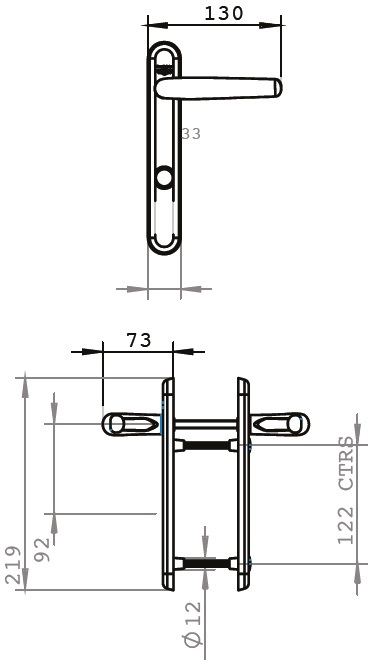 For 44mm composite doors, we have designed a special 65mm 25-10-30 (30/35) UAP+ 1* Kitemarked cylinder to use with the high security front door handles, which fits perfectly into these 44mm door profiles. Used to test the colourfast of plastic and anodised products, the UV machine measures the stamina of the door handle finish, testing how quickly it will fade in sunlight. It does this using UV lights which the products are left under for 2000 hours. 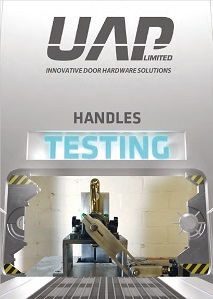 This machine tests the corrosion resistance of the door handles and many other products. The salt spray cabinet produces a corrosive environment, by releasing a dense saline fog into the chamber which the products are exposed to. This creates accelerated corrosion to the product and allows us to test how well the product would stand up in harsher environments. UAP Ltd distribute a wide range of door handles, made from aluminium, zamak and Nanocoast 316 grade stainless steel. Coating Guarantee = the sooner of “the guarantee supplied for the door or window from the manufacturer” or “5 years inland” on aluminium and zamak based door handles or “Lifetime” on Nanocoast 316 grade stainless steel based door handles. 1. 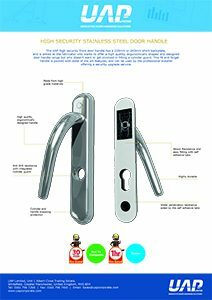 The door handles are applied to a door or door panel, and no item of door furniture on the door or door panel are sealed or fixed using any form of silicone sealant or the like. 2. 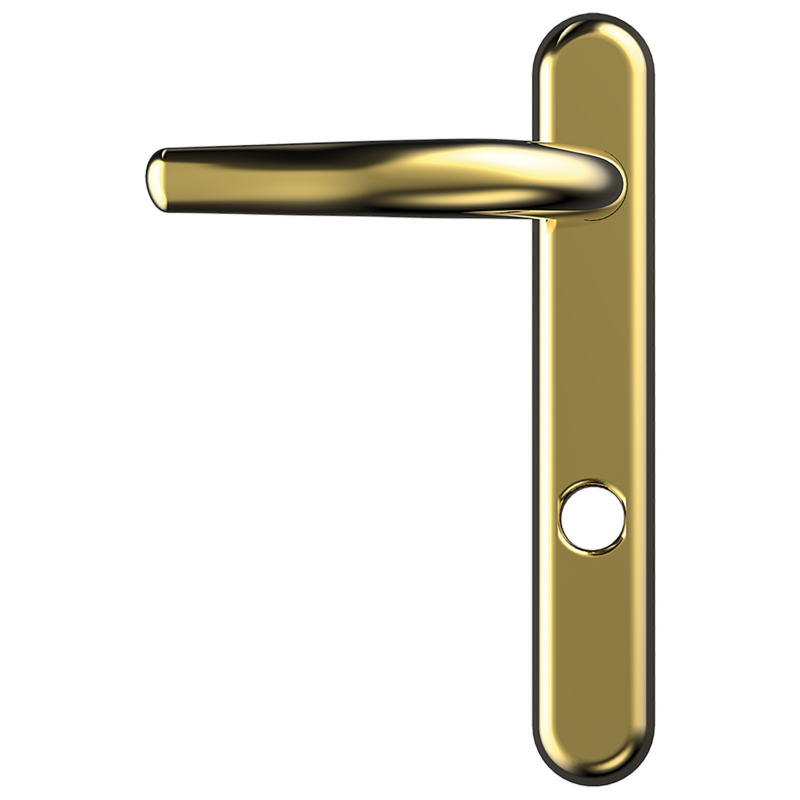 The door handles are fixed correctly and the right way around using the correct fixings, and are not scratched or damaged at any time during the installation process or thereafter. 3. Nanocoast 316 grade stainless steel based door handles are cleaned with a lemon based very mild soap solution and a soft cloth once a month, or every 2 weeks in areas of high sea salt such as coastal areas. At no point should any form of cleaning agents be used. 4. Aluminium and zamak based door handles are installed inland (defined as 25 miles from the coast or 5 miles from highly populated industrial areas) and are cleaned monthly with a moist cloth. At no point should any form of cleaning agents be used. 5. No claim will be accepted for any door handle that is scratched or mutilated or fitted incorrectly. 6. The guarantee only applies if the door handle is fixed to the original door for which it was bought and fitted by the installer. The guarantee will cease immediately if the door handle is removed from the original door or door panel. 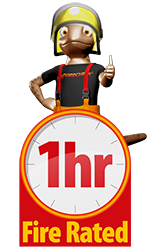 Mechanical Guarantee = the sooner of “the guarantee supplied for the door or window from the manufacturer” or “5 years inland” on aluminium and zamak based door handles or “10 years” on Nanocoast 316 grade stainless steel based door handles. 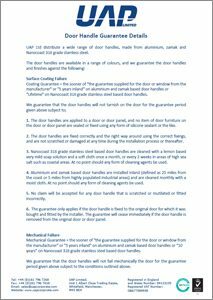 We guarantee that the door handles will not fail mechanically the door for the guarantee period given above subject to the conditions outlined above.